Here you’ll find a tutorial // description of our Beat Machine. Record up to four Tracks. Clicking one of the RECORD Buttons will immediately start the recording. Clicking on the same RECORD Button again will stop the recording. Create empty Tracks by deleting [see DELETE-Mode]. 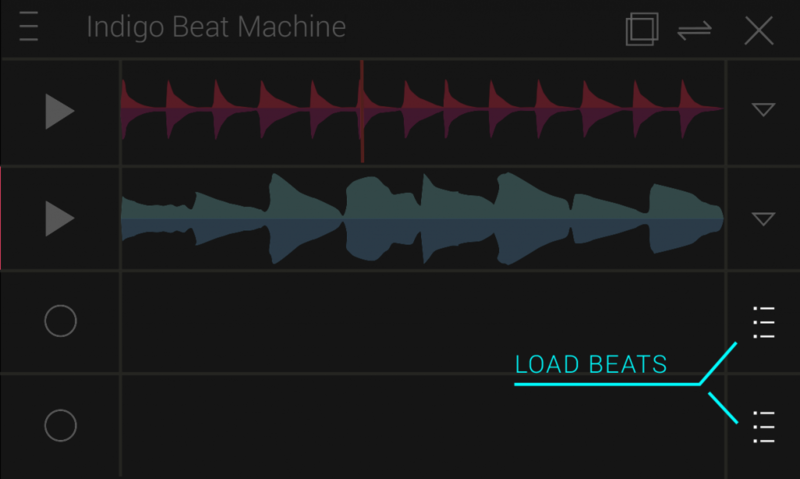 If you want to create a Beat with a new overall tempo (different BPM- Beats per Minute) – delete ALL previously created Tracks, Otherwise the internal GLOBAL-CLOCK is taking care of the exact loop length for you! This feature ensures that you will always get perfectly fitting loops! Instead of recording a Track you can also LOAD a previously recorded Track! 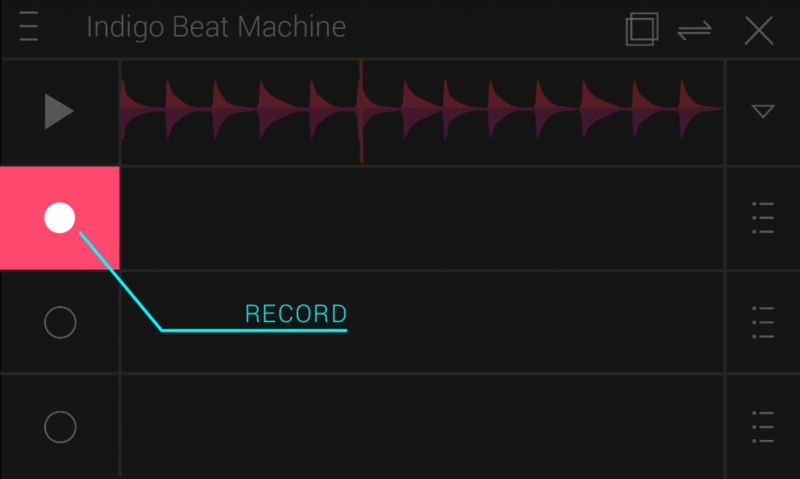 Clicking on the BEAT-List Button of an empty Track will show you the list of stored BEATS on your Device. Clicking on the LOAD Button will bring you back to the main-screen and load the selected Beat. If you have any Track existing while loading a new one – than the loaded Track will adopt the tempo of the existing Track! This guarantees perfectly fitting loops! You can download more Beats from our GOOGLE-Play website! All Beats are stored in the /Beats/ Folder of your devices internal storage – they will NOT get deleted if you uninstall the application. Each non-Empty Track will have the RECORD Button replaced by the PLAY Button! Clicking on the PLAY Button will start and stop the playback of the Track. start-position of a Track see: Global Functions / Change-Delay. Next to the Play Button you see the TRACK-STREAM-Display displaying the recorded and modified WAV-File. 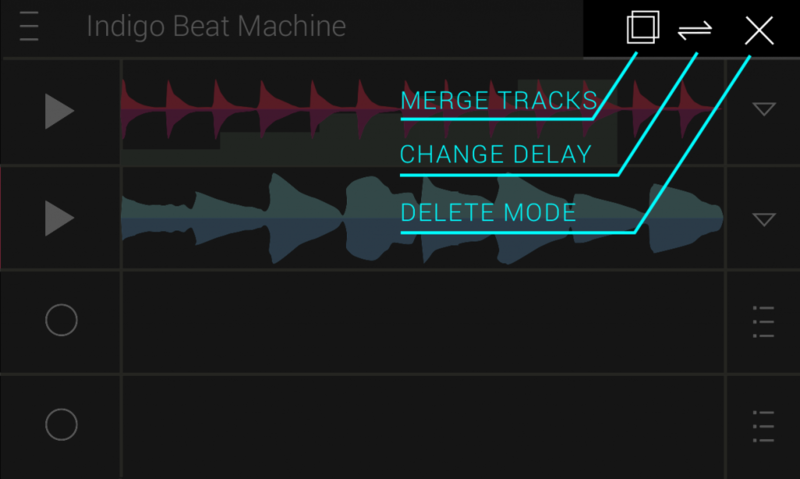 This area is used to set the individual volume of each track, as well as for the globalfunctions [see MERGE-Tracks, Change-DELAY, DELETE-Mode]. Track and ‘drag and drop’ it one top of another Track. the appearing TIMERWHEEL will change the start-position of the Track by 5 milliseconds. 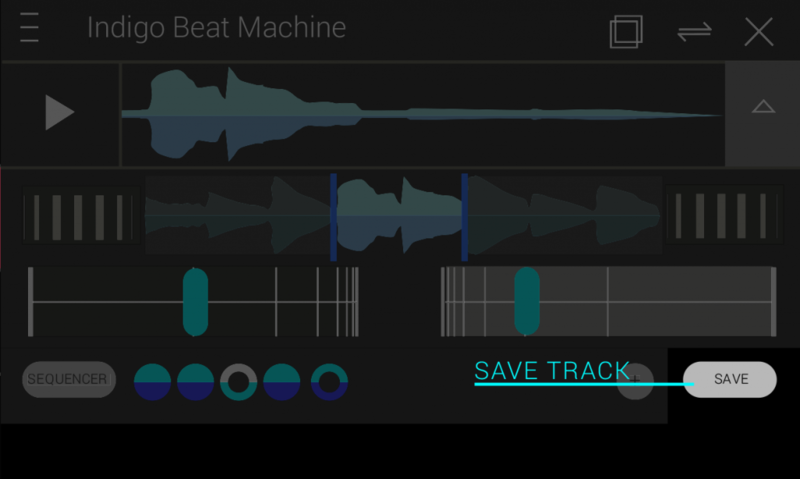 This feature is good to create Echo-Sounds, or to simply fine adjust your BEAT! Click the DELETE-Mode Icon and choose the Tracks you want to delete. This will permanently erase your Track! Each non-Empty Track will have the BEAT-List Button removed by the TRACK-Menu Button! Clicking on the TRACK-Menu Button will open the TRACK-Menu of this Track. 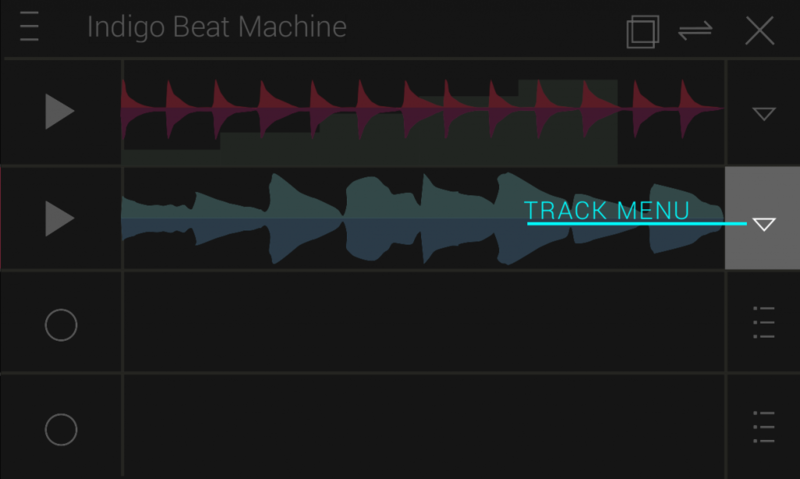 Inside the TRACK-Menu Options to set Loop point positions, Change Tempo / Change Pitch, use the sequencer, save the Track just as it sounds right now with all your modifications! [see TRACK-Menu for more details]. Using the STRETCH-Wheels you can change the looppoint positions of the Track while at the same time streching or compressing the PLAYBACK-Rate of the Track . 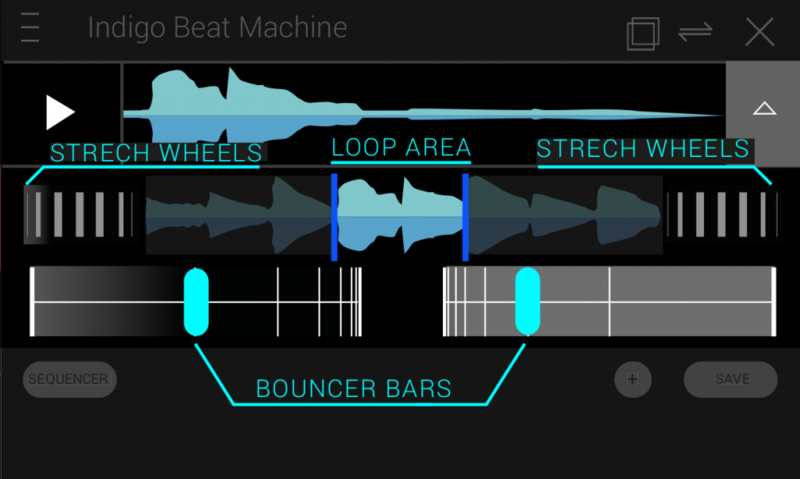 Using the BOUNCER-Bars you can change the looppoint positions of the Track WITHOUT changing the PLAYBACK-Rate! This will increase or decrease the length of your Track by the power of two. The smaller TRACK-STREAM-Display of the TRACK-Menu shows the full, unmodified length of the Track. After changing looppoint positions with the BOUNCER-Bars or the STRETCH-Wheels you will see the resulting LOOP-Area here. Sliding the displayed LOOP-Area will move the looppoint positions accordingly. By Clicking the SEQUENCER Button you will activate the STEP SEQUENCER for this Track. Toggle the steps ON and OFF to create rhythmic patterns! 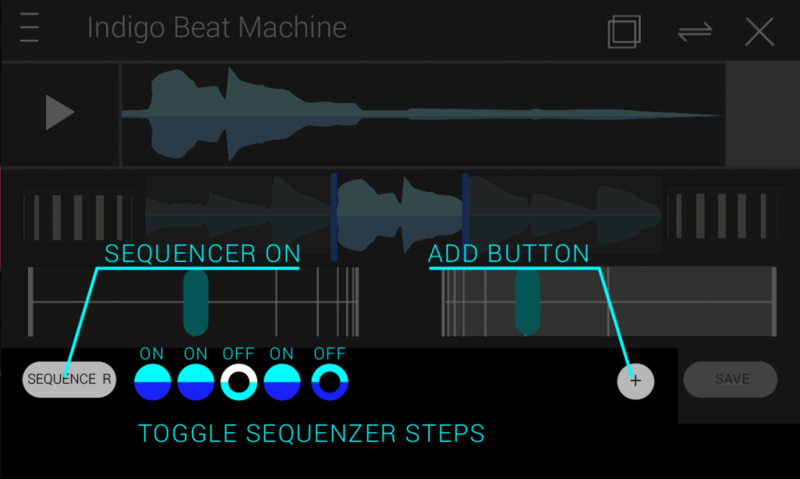 With one Click on the small ADD Button you can change the size of your SEQUENCER Pattern. By Clicking the SAVE Button inside the TRACK-Menu you will save this Track as it sounds right now! A WAV File will be generated with 16bit, and a standard 44.100kHz Samplerate – for this heavy RESAMPLING computation might be involved – just be a little patient! For Ideas, Suggestions and BUG-Reports please contact us. 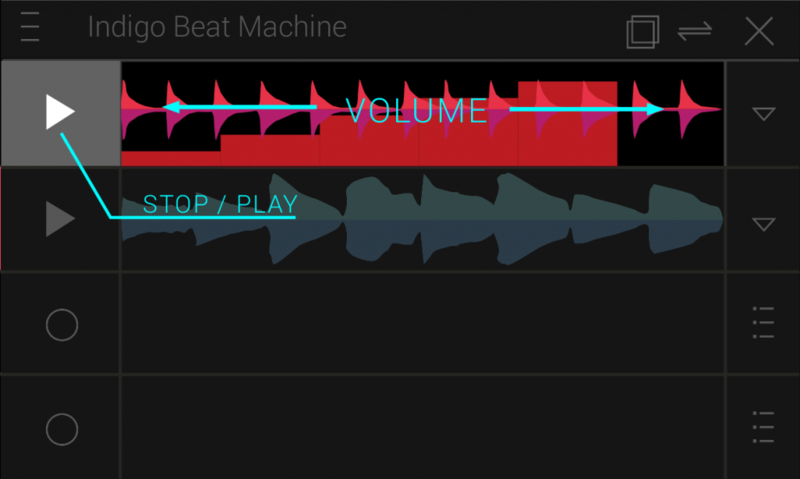 You can already do this with the integrated mp3 Cutter App! So far I really like this app! Very interesting and creative. Still learning. How do u store more beats? Having a little trouble understanding. Please help. how can i post my Beat on youtube and how comes it dosent pop up and my music, i dont get it? Hi Vernando, all of your beats are inside a “beats” folder on your phone (any filesystem explorer can find them). Also you can share your beat via email and from there put it onto youtube. Hope that helps! Best J. A new sharing functionality will be coming eventually! This in progress!